Following on from the worldwide success of the “Rivalries” television ad from 2005, Coca Cola Argentina has launched a further six stop-motion spots in the lead up to the FIFA 2006 World Cup. A fly hovers in front of a red fly swat watching the football on the television. 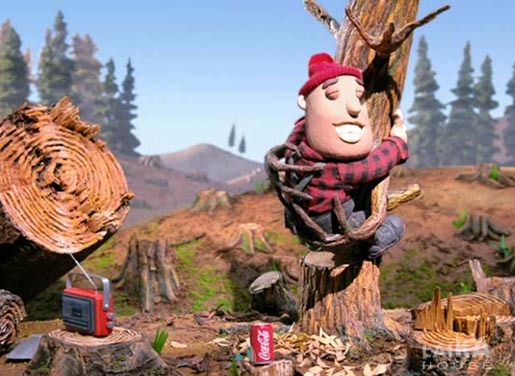 A lumberjack pauses in the middle of chopping down a tree, distracted by the football on the radio. A chef in the kitchen pauses before dispatching a chicken with a cleaver. A hippy listens in his den. And then the magic erupts, to the sounds of Pachelbel’s Canon. A scientist in the lab sees the pivotal moment on the television and yells “Goal!”, joined by the lab rat on the bench. The lumberjack hugs his tree in delight. The fly and swat high five. The chef and chicken leap for joy. A cactus and balloon embrace. The hippy embraces his helium balloon. A man and woman are watching the game from their bed. He leaps out of bed to celebrate, only to be joined by another man who’s been hiding in the wardrobe. There’s an awkard moment of silence before the two men embrace one another in a moment of true soccer fervour. ‘Futbul Rivalries’ began in Argentina but made its way around the world, adapted to the cultures of football-playing countries. A bat salesman lines up pairs of eyes on a table and yells out, “Lynx eyes, guys! Lynx eyes to watch the World Cup!”. A Coca-Cola bat stops and orders two and puts them on. The super: “Everyone and everything, supporting Argentina!”. An electrician is fixing a refrigerator, listening to a soccer commentary on the radio. “The team did exercises with the ball and then rested the whole afternoon.” The electrician goes nuts with pasion and yelling support for Argentina’s afternoon rest. The fridge comes alive and joins in, yelling support for exercises with the ball. The fridge puts her hand inside herself and pulls out two Cokes, gives one of them to the electrician, and they toast. The super: “The electricians. The refrigerators. Everyone and everything, supporting Argentina”. An old man sits on his sofa, watching the football on television. When the going gets exciting his toupee jumps up and down, throwing out its arms and chanting for its favourite team. The super: “Los Abuelos. Los Peluquines. Todos Y Todo, Alendando A Argentina” (The grandparents. The Toupees. Everyone and Everything Supporting Argentina). A four leafed clover, a rabbit’s foot and a horseshoe sit on a couch with their Cokes in hand, watching the football. As they start to cheer for Argentina, they realise that the Horseshoe is not wearing the lucky briefs he was wearing last time. The foot and clover leaf throw their hands up in despair. “Oh boy… We’re screwed.” “How could you forget!” At this critical moment the briefs appear and jump into position on the couch. The lucky charms can breathe again. Voiceover: “The lucky charms. Everyone and everything supporting Argentina”. The Rivalries spot, and the six follow-up spots, were created at advertising agency Santos Buenos Aires by Sebastian Wilhelm and Maximiliano Anselmo. Mark Gustafson at Laika (previously known as Vinton Studios) directed the animation, with producer Lourri Hammock.